Nick Kyrgios lost the second set but battled back to beat Kyle Edmond. 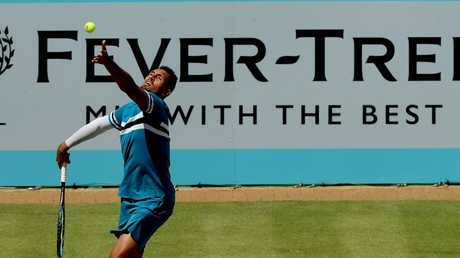 NICK Kyrgios has weathered a swearing controversy as his Wimbledon preparation continues to gain momentum after a freakish serving performance at the Fever-Tree Championships at Queen's Club. Kyrgios fired 32 aces in a 7-6 (7-3) 6-7 (5-7) 6-3 triumph over Australian Open semi-finalist Kyle Edmund. But he was unrepentant after the BBC was forced to apologise to viewers after its telecast was peppered with his swearing late in a tense contest. 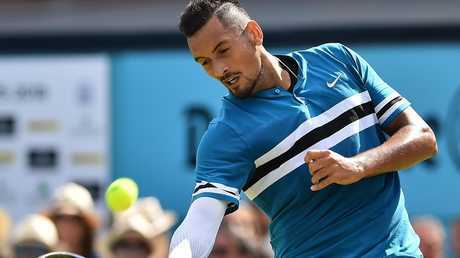 Asked how he felt about the broadcaster's apology by a BBC commentator, Kyrgios said: "Fine. I don't care." Again declaring he could be a "big" Wimbledon threat, Kyrgios conceded he tightened towards the end of the match. "I feel pretty good. I got a bit tight towards the end of the match, which is normal," he said. 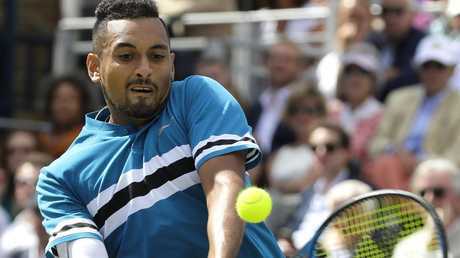 Nick Kyrgios is set to face Feliciano Lopez in the quarter finals. "I haven't played a lot of matches in the last couple of months. So, I mean, when I'm serving out a match … we have been playing for a couple hours and level has been pretty good. I got pretty tight. "Yeah, apart from that, I'm always pretty relaxed. 32 aces helps. "I thought it was a pretty high-level match from both players. Obviously I served really, really well. I found my rhythm quite early. "But, to be honest, he got pretty much every break in the second set. Net tapes, lines, everything on big points. "I thought I played well enough to get a break there. But on grass, I thought he played well today, honestly. He served well. He returned well. "I got a lucky break in the third set. He made a couple loose errors, and that was pretty much all that was in it." Kyrgios probably should have clinched the match in straight sets and, after struggling to close out the match, pounded a ball high over the grandstands. "Serving for a match of this value is not easy and I was just happy to get through it," he explained. "I wanted it. I haven't played too many matches the last four months, obviously." As vital as the success was in terms of confidence, the rankings points Kyrgios pocketed also count towards his Wimbledon seeding. Ranked 21st in the world, Kyrgios is likely to rise in the seedings under the All England Club's unique formula, which takes into account grasscourt results. 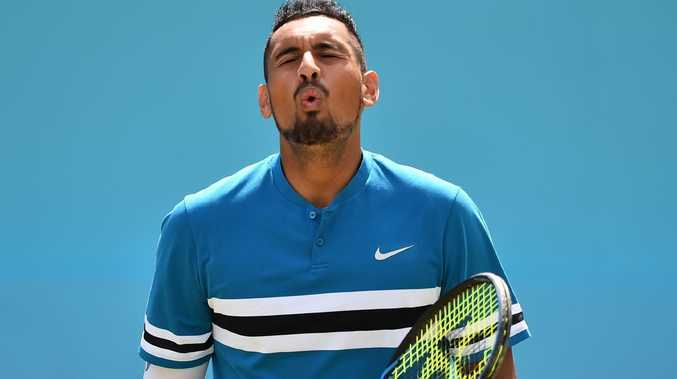 Despite losing first-round at Wimbledon last year when injured, Kyrgios' effort this season to reach the Stuttgart semis and now the Queen's quarters will result in a boost. He will next play defending champion Feliciano Lopez, who was given a walkover into the last eight after Milos Raonic withdrew with pectoral muscle soreness, for a place in the semis. Kyrgios beat the Spanish veteran last week. 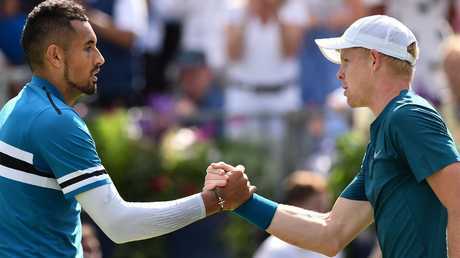 Imitating Roger Federer and Gael Monfils' service action while unloading missiles at Edmund, Kyrgios was untouchable in the first set. He won 88 per cent of points on his first serve - a weapon which should carry him a long way at Wimbledon. In Germany, Matt Ebden downed German Philipp Kohlschreiber 4-6 6-1 6-2 in Halle to provisionally claim a career-high ranking of No 50. The West Australian was ranked No 696 at the start of last season as he recovered from a knee injury. Ebden will next play world No 1 Federer. Q. How relaxed were you? You were looking very relaxed on court and seemed to be having a darn good time out there. How relaxed are you feeling? KYRGIOS: Yeah, I feel pretty good. I got a bit tight towards the end of the match, which is normal. I haven't played a lot of matches in the last couple of months. So, I mean, when I'm serving out a match - you know, we have been playing for a couple hours and level has been pretty good. I got pretty tight. Yeah, apart from that, I'm always pretty relaxed. 32 aces helps. KYRGIOS: Of course. Great observation by you. Q. There was a point earlier in the match when you let out a swear word and then you apologised to the people at the side of the court, but then at the end - well, is that something you'd like to keep more under control or does it not bother you? KYRGIOS: No, do you swear? Yes or no? Yes or no? Do you swear? Do you swear? Q. I have been known to. KYRGIOS: Okay, great. Good question. Q. How do you feel the BBC had to apologise on air today about your language? How does that make you feel? KYRGIOS: Fine. I don't care.